The portrait of the artist depicts an elderly man. The portrait is close to realism, but permeated with the spirit of impressionism, so characteristic of Renoir. An elderly man looks good look. But at the same time, this look is full of sadness. He is filled with thoughts about the life he has already lived, that the greater is already behind. The man is calm. In his view there is no that power and confidence characteristic of young men. His eyes are full of peace and tranquility. Deep wrinkles are visible, which have already significantly changed the appearance of the artist. In these wrinkles – the prints of hard life, the search for yourself and many years of work. The man has dark eyebrows. At the same time he has a completely gray mustache and beard. The whiskers are already quite long and twist in waves in different directions. For the dense vegetation of the face is impossible to see the lips of the artist. The man is depicted in outerwear. Dressed the artist is not rich. On the artist’s bowler hat is a light brown color classic for this type of hats. Under the hat you can see the ear, which sticks out a little. Was the artist sticking out his ears or was this the result of frequent wearing a hat? A scarf is tied around the neck of a man – a rather typical for those times element of a man’s wardrobe and a great alternative to a modern tie. The scarf is tied with an intricate knot – it gives out the creative nature of the author. On the shoulders of the artist black coat made of thick fabric. The corner of the collar is deflected and bristling. 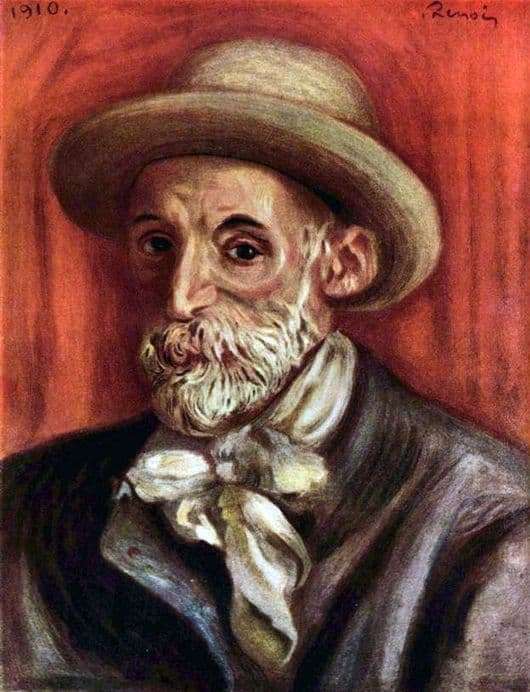 In general, the self-portrait of Renoir leaves only positive emotions from viewing. Not a single detail of the image leaves a negative impression. The portrait is permeated with kindness, warmth and tranquility of the artist who is completely satisfied with his life. Life has almost come to an end – to change something is no longer possible. He understands this, he is looking for advantages in what he has achieved.